Sleep for our babies, as every mummy knows, is really important. Sleep for ourselves, as every mummy knows, is half important. 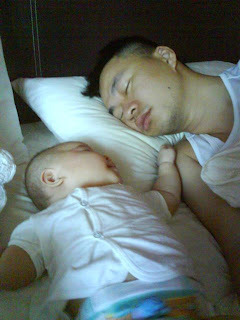 For the mummies part first...sleep for ourselves, most of the time, is when baby sleeps. So counting that most mummies (who do not have helpers), can sleep when baby sleeps, we sleep lesser than our babies on the whole. Plus if, like me, i go on and catch up with my 101 stuff i want to do after Eliza sleeps. 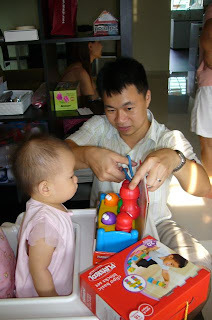 101 stuff to do = sort out the mess in the house, facebook, reading new/blog/resources online, watching tv (like xiao niang re..if Eliza sleeps before 10pm), talking to Ww..that's about it. Somehow i can't seem to do much productive in the baby-dream hours. On some occasions, i'm at home, i'll nap with Eliza....which is a wonderful thing cos i love to nap. 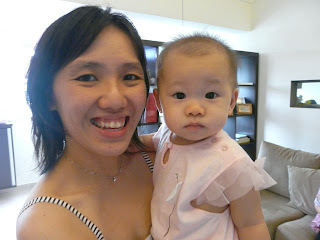 Last sunday, we came home after church & lunch with just-slept Eliza. Ww joined Eliza in the afternoon nap. I wish i could, but considering Eliza not eating much that day & rejecting the bottled food, i decided to cook her porridge. That & taking in the clothes & folding the clothes took me the length of her nap. when i comfortably sat on the sofa to check out any tv prog, Eliza promptly woke up. Problem was, by 330pm i was so sleepy and Eliza was at the peak of her play. 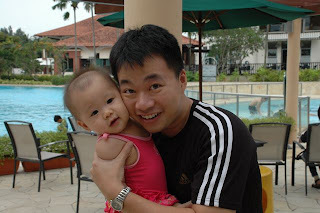 I left Ww to play with her while i drifted in and out of sleep, cos i was already dozing off watching her play.i drifted in and out cos she was climbing all over me, and occasionally she was crying (cos daddy didn't let her touch the power point/wire..so she was whining). i ended up sleeping till 430pm. ah...nice. somehow i have this problem of not being able to do some things while Eliza's awake & exploring; like surf the net (cos she'll want to join in too), or read a book (cos she'll be interested in what i'm reading), or write stuff (cos she'll want to write too), or sleep (obviously i can't sleep else there won't be anyone to watch her, actually not even when my in-laws is around). 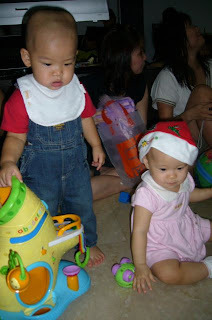 oh well...maybe when she's older, when we can do stuff together without messing up the whole place. Then it's sleep for Eliza. I learnt that unless an event is over and we're on the way so somewhere, Eliza won't fall asleep. So she'll only sleep when we're on our way to lunch/home after church service, or after the gathering, or after the wedding, or...you get the drift. I believe it's the 'i won't want to miss a thing' spirit in her. Now that she's older, she can stay awake longer and will make sure she does so when the need arises. So sometimes i really prefer to be sleeping at home. easier to fall asleep & better environment to sleep in...although i do hear frm my mil, that often after 45mins of sleep, she'll surely wake up if the phone rings. On days when my patience wears thin, i'll tell her in a stern voice that it's time to sleep, sometimes she'll guai guai lie down ...but that's sometimes only. Nowadays, she'll willingly point to her cot and get in her cot to roll around after some rounds of crawling around our bed. Taught her to hug miffy the rabbit and she did it today! 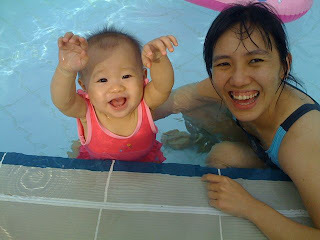 haha...she also gave miffy a wet open-mouth kiss. (somehow her kisses to us is an open-mouth kiss on our lips or noses...really adorable!). If i catch her at the right sleepy time, like today, she'll roll in her bed, rub her eyes and roll somemore and eventually fall asleep without much fuss. Thank God! REally very cold...the wind was strong & the water was cold, though u get used to it after a while..Eliza doesn't mind though. 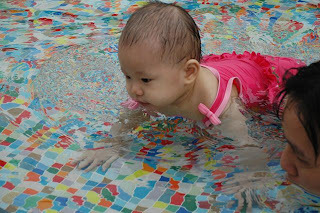 Crawling at the shallow pool. wanted to teach her how to blow bubbles in the pool but i think it's a lil too advanced for her. 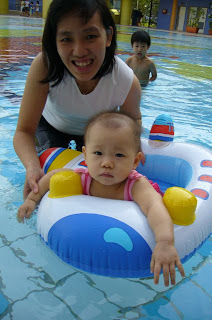 haa..cos she kept choking on the water. her shirt was up cos she poo-ed and i was going to wash her up but she found more fun splashing the recycled water from our washing clothes water, if i wasn't going to bathe her after that she wouldn't have had so much fun. I'm sleepy now anyway...time for me to sleep. 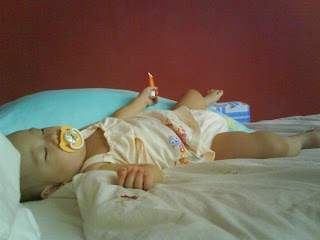 This was during our ritz carlton stay...'maximizing' the use of our room..playing with Eliza, that is. 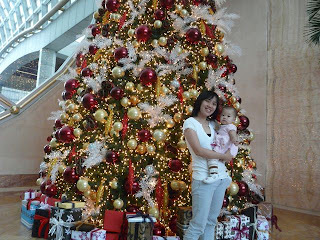 We had a peaceful Christmas this year, with a cell lunch after church service, and dinner at home with my mum & sis. Love the Christmas season..somehow things seem to slow down (ok despite the stressful buying gift for my mum...) Was reminded in the midst of Christmas gifting, that Jesus is the gift. Today, we had time to slow down and be home doing the usual play and day stuff. Woke up at 9am and went to TM to do some groceries shopping. Had to start trying out different foods for Eliza as she was getting less keen on her porridge. I had so much trouble trying to get her to finish her porridge, she ate probably only about half of what she usually ate. Couldn't tell whether she's hungry or teething or sick. No cajoling or new toys or tv would make her eat more, she just stuck her tongue out when i try to feed her...after lots of ducking from the spoon. BUT when i started eating my own lunch she'll come after me for it. I guess it's time to change her menu...or at least start to eat together. hmm...somehow i got so used to making porridge for her i'm at a loss of what else to make. i tried mashed potatoes, scrambled eggs....then again, in comparison to what she usually eats, it seems much lesser. 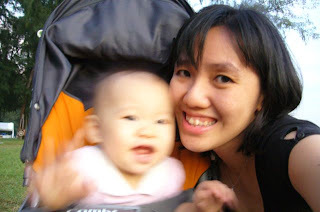 YP mentioned i haven't been updating this blog...yeah...somehow i wonder with Eliza being older, i've been more busy with 101 other things (not unusual). the past weekend was quite busy cos we went to Ritz Carlton, and there was the YZ camp before that which was quite tiring, actually..but at least Eliza had quite a lot of fun swimming. now..it's more like what am i doing after Eliza goes to zz?i can't really remember, really. The other big question is whether i should con't or stop working after no.2. so far the conclusion is, if we don't get a maid, i'll stop working..and learn how to be the maid; and if we do, then i'll have to con't working. We'll see, we'll see. recently my compant laid off 5-6ppl....so...what if i do get laid off? then i guess i'll get to be SAHM earlier? hah. Then again, i'll still need a job...boohoo..cos that extra will help a lot. So...whatever happens, we'll trust God, and know that He has planned and provided for whichever direction we end up with. for that 3 days, because we went home at 10plus, she slept at 11+pm for 3 days. i was worried she couldn't get back to schedule but thank God we were back on track the next day. it was a lil hard on me cos she was quite sticky to me and doesn't like and let anyone carry her..so i end up telling everyone that they can play with her but don't attempt to carry her...else she becomes hostile. well..that's my fiesty girl for you. 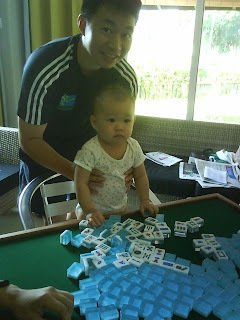 Eliza trying out her hand at mahjong?? doing her 'arms up' action at the pool. 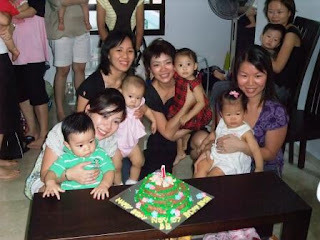 i got quite crammed calves the next day cos i was squatting down most of the time...the pool was only 0.5m deep. it was really quite cold there cos there it was quite windy so we couldn't stay too long at the pool. there was a fun pool side with fountains but it was too shallow and Eliza was shivering, so we migrated back to this shallow pool instead. 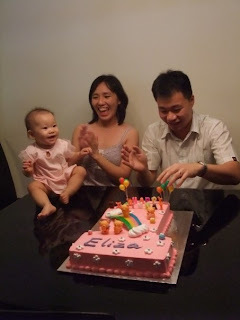 We initially thought of not bringing Eliza for the 1st night and then letting her join us the 2nd night, eventually all of us stayed together for both nights cos it was just more fun with her around. And surely she enjoyed it...so much so, it was hard to put her to sleep at night without a walk in the stroller to 'knock her out'. 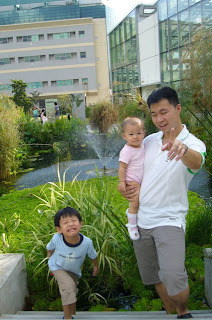 one last photo before we leave...daddy couldn't make it that morning cos he had food poisioning. 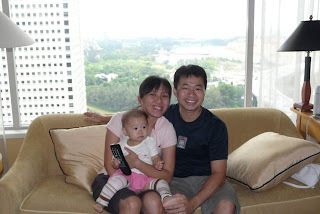 we planned to attend New Creation church service and go for good lunch after that, oh well...anyway poor daddy was down for the next 2 days...we suspected it was something we ate for dinner at DianXiaoEr...then again, the rest of us wasn't affected. 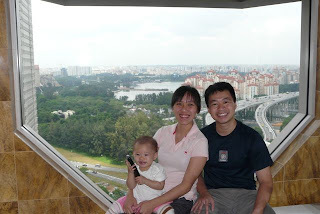 actually we wanted to go pasir ris park but it started to pour on our way there, so we dropped by T3 airport instead. 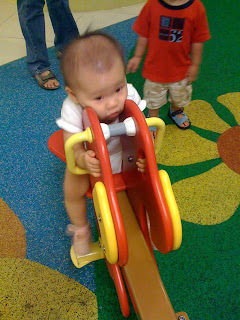 this is one of the rides she can best sit on..then again, there's not much at that playground there she can play with. This week she has been practicing her standing up...and she'll be so delighted at herself that she'll be squealing with laughter. This is what she showed me she could do when i came home from work. After everyone's gone home, it's time to open presents! The last and biggest present to open. By then she was quite tired of all the new things...so she didn't look too excited here. 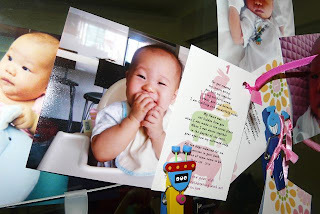 Reflections on being a 1yr old...mum. you never experienced pure delight and sunshine till you have a baby. We've watched her grow, watched her sleep, watched her eat, watched her play. At the same time we grew with her, slept with her, ate with her and played with her. Eliza, our first born, will have that special advantage of being showered upon all that attention from mum, dad & her grandparents. 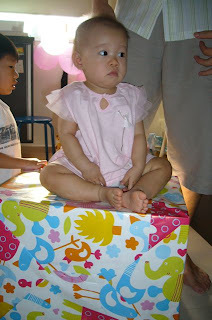 When she was smaller we'll wonder if other babies are like her, especially when Ww's mum will comment that she's not like other babies she has taken care of before, not even her cousins. 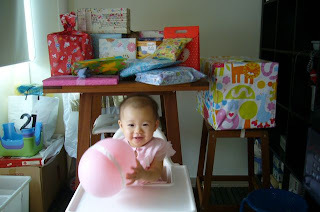 Still she's quite like most babies, but of course as parents (and very biased ones), we find her the cutest & funniest. After being with her so much, how can we not know her, all her nuances and kuan4. Yet we're discovering new things of her each day, new fun things to learn and play. At the same time she's discovering herself and being delighted at what she can do. Even in this one year, so many phases have passed, from sleeping and feeding schedules, to being mature enough to manage her burps; from being immobile to rolling over, to crawling, to cruising...and soon walking. The current fun thing she's up to is pushing her walker & getting up and down from her car. At first she needed our help to get up on her car, but now she can get on and off it on her own, and use it to move about. It's so funny to see her pleased at being able to do so. Two days ago, at the chalet (our youth camp retreat) she started doing the "arms up" action, which she'll do on cue. She loves to lift up our shirts and poke our belly button (and sometimes she does it on her own as well)....and then she'll break into pearls of laughter. What about me? What has Eliza taught me in this year? I am learning patience. 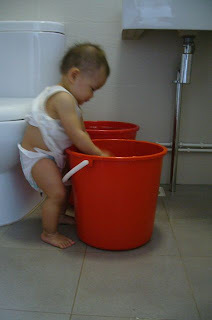 I am learning that there really is a time for everything and a time for a baby to find their time. I am learning how to let go. I am learning to let go of the expectations i put (or sometimes force) on myself and/or Eliza, that sometimes things don't have to always go the way i want. I am learning more songs. We sing the same old songs again and again to her...though sometimes i wonder how come i can't remember some songs i thought i knew. So time to refresh my memory! 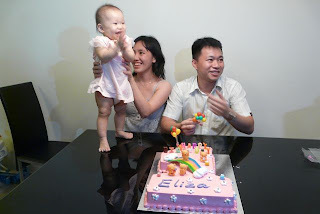 Eliza is already 1 yr old! 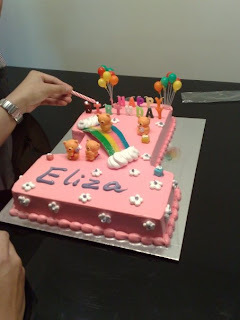 We have been having great outings and suddenly as if with a turn of an eye Eliza has grown up. 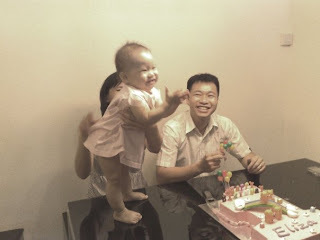 she has become more cheeky, more mobile (not that she is walking yet but she doesn't fall down when she crawls now), more feisty, more dong3 shi4, more fun to play with (not that she isn't last time, but it's a different dimension of play now) and slightly more hair. babies from the 2nd half of nov...realized most of the babies were born on mid-nov. hot dates! 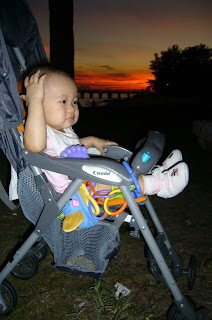 After that we went for dinner at east coast beach...actually Ww wanted to do his run b4 e marathon...but by the time we reached there it was quite late so he only did a short run while Eliza had her dinner by the sunset. It took real fast for the sun to set...even though the pic you see here looks quite bright. Eliza was taking quite long to finish her dinner...by this time i was trying to race with the sun...whatever light is left is good. 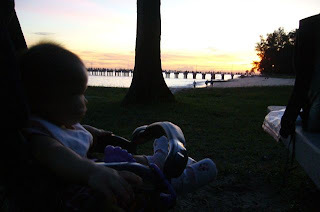 Still haven't finish dinner..tsk tsk and yah..i was still taking photos...the sunset was really beautiful. i took leave as Ww's colleague lent him his car for the week so we took the opportunity got out. 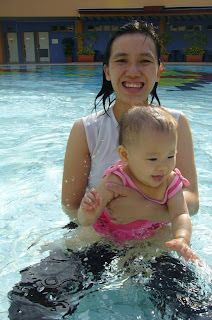 We finally went to take Eliza to swim for the second time, this time at Tampines Swimming Complex, as the pools are bigger than Safra's and has the water slides for Ww's nephew who's staying over that day. She wasn't too keen when she first got into the pool, particially cos it was really windy and the water was still quite cold. 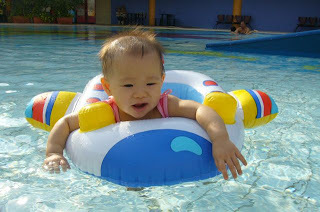 After that her cousin took over the airplane float and Eliza was just as content splashing the water. After that we went to ikea for lunch, queenstown to get shorts, and Eliza slept for 2hrs...all the way till when we were almost done walking Hort Park. Still she did wake up in time to admire the flowers in the greenhouse. Check out a live-sized cow!! Actually it was an exhausting day. The next day when i went back to work, i was telling my colleague that it's more exhausting to be on leave than to be at work. 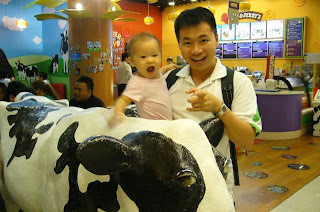 Then again, it's more fun to spend time with Eliza. More reflections next time...i have to sleep.